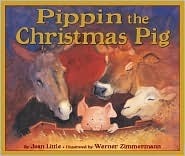 Description: Pippin the pig shows the boasting barn animals that giving of yourself is the best Christmas gift of all. Tomorrow is Christmas, and all the animals are boasting to little Pippin the pig about the important gifts their VERY-great-grandparents gave to the special baby that was born in a stable long ago. When Pippin wants to know what the pigs gave, the animals scoff - what could a pig have given a holy child? Dejected, Pippin heads out alone into a raging snow storm. There he meets a lost mother and baby, and leads them to the warmth of the barn. And in caring for this family in need, the animals see that giving of yourself is the best Christmas gift of all. Jake's Review: This is a nice easy book to read about how a bunch of animals (Especially the little pig) help a mom and baby find a warm place to sleep on a cold Christmas night. Sorta of like the baby Jesus story. Its kinda cute and I like how the illustrator drew the little pig Pippin. Mom's Review: A lovely simple tale about the meaning of Christmas and of family with sweet illustrations. There is some nice humour and the animals have very honest human like emotions. A perfect book for a Christmas story-time session or just to read to your kids over the Christmas holiday. Description: If you've already plumbed the depths of the sea by the time you're eight, there's nothing left but to climb the world's tallest mountain. So figures Peg, the feisty heroine of a delightfully outrageous tall tale by award-winning children's fantasy writer Kenneth Oppel (author of Airborn and the Silverwing trilogy). 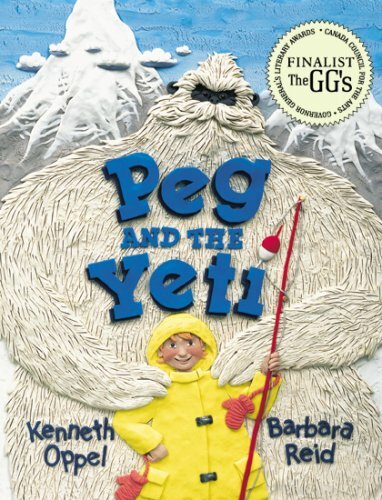 A follow-up to Oppel's equally whimsical picture book Peg and the Whale, Peg and the Yeti describes the incredible journey of this pint-sized adventurer to the top of Mount Everest and back. Jake's Review: The pictures are really funky but I found the story kind of stupid. The Yeti was cool though! Mom's Review: I'm not a fan of the Peg series as I find her a bit irritating, but Reid's illustrations really make up for it. She is truly a unique illustrator. The storyline is cute and I can see young girls being a fan of Peg as she can do anything, which is a nice message, but in general not my favorite picture book. Description: From time to time I dream that I''m a manatee, Undulating underneath the sea. 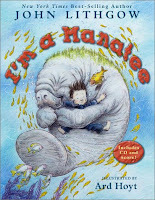 A little boy dreams of becoming a manatee, and what a dream it is! With his new gigan-atee manatee proportions, he sets off on an underwater adventure with his manatee friends. Jake's Review: This is really funny to listen to, the guys voice is hilarious. I like the pictures in this one and think the midget will like it too. When you read the book without the CD it isn't as fun, much better with the weird guy reading and singing. Mom says this guys is an actor and I think I would like to watch movies with him in it, cause he sounds like he's just a big kid. Mom's Review: This is a truly charming book to listen to as Lithgow has the perfect over the top voice and gives so much personality to a rather simple story. The illustrations in the book are delightful and go nicely with the imaginative tale. I would recommend this one to read to your child as some of the language is quite difficult. However, it would also be fabulous for expanding vocabulary with older children. Honestly, this works so much better when Lithgow reads it as he makes all the big words sound so delightfully silly that kids will pick up the words and not realize they are actually learning something. Description: Bright and fresh with an innovative art style, this debut picture book from a huge new talent is sure to win lots of fans! Bird wakes up feeling grumpy. Too grumpy to eat or play -- too grumpy even to fly. "Looks like I'm walking today," says Bird. He walks past Sheep, who offers to keep him company. He walks past Rabbit, who also could use a walk. Raccoon, Beaver, and Fox join in, too. Before he knows it, a little exercise and companionship help Bird shake his bad mood. This winsome, refreshingly original picture book is sure to help kids (and grown-ups) giggle away theirs, too! Jake's Review: This is a really funny book. Grumpy reminds me of both my parents and the midget. I like how the bird is in a bad mood and than slowly with the help of his friends loses his grumpiness. The pictures are funky and I would like to read more books by the author that are more for my age, as this one is more for little babies. 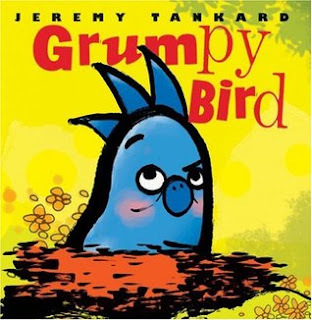 Mom's Review: I love Grumpy Bird, he totally reminds me of my kids, ok and me on some days. This is a truly delightful little story that everyone can relate too. It is sweet and honest and it will delight everyone from the littlest baby to the grumpiest Mom. The illustrations and colour scheme are very unique and add to the appeal of the story. I highly recommend this one for story-time and a perfect book to read to your kids on a rainy day. I met Tankard at the OLA last year and he was hilarious and a truly unique man as well.